Back around 1992, I might have been one of the first couple thousand people to try commercially available creatine. It was in a product called Phosphagain, created by Anthony Almada and marketed by Bill Phillips through a magazine called Muscle Media 2000. In my youthful quest for weekly strength gains indicative of at least an inkling of muscle growth, I immediately fell in love with that product. 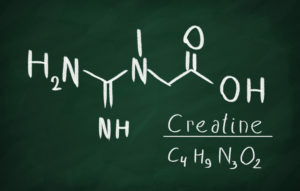 The subsequent rise in creatine’s huge commercial success can be attributed to exactly what its appeal was to me – it enhances exercise performance by noticeably raising strength and repetitions during workouts. Greater workout strength and repetitions are easily equated with increased size and strength gains in a user’s mind; if one and one equals two then a boost in gym performance means a better body… right? Anyway, creatine is still popular, albeit commoditized way beyond revelatory status by this point. Is it underappreciated? Is it ‘anabolic’ or does it just boost performance like, say… caffeine? Biologically created in the body by arginine, glycine, and methionine, this endogenous form of creatine is synthesized by the liver and kidneys then mostly resides in our muscles, brain, and heart. When these organs use anaerobic energy (without oxygen), they burn a phosphate donated by ATP. When ATP phosphates are exhausted, they become ADP and need to regain a phosphate to become ATP again. The most efficient way for ATP to regain a phosphate is by taking it from PhosphoCreatine. Bottom line: Supplemental creatine creates a bigger PhosphoCreatine ‘pool’ in the body, thus allowing more ADP to be replenished back into ATP, which results in noticeably better performance. So where’s the net gain in this scenario? Unless creatine accelerates recuperation, it would seem its performance enhancement eventually becomes relative to no enhancement at all. This might be akin to caffeine. Non-caffeinated athletes get a boost in performance from just a strong cup of coffee. But athletes who consume caffeine daily get no further boost at all. Does Creatine Build Muscle via IGF-1? IGF-1 is an anabolic hormone produced mostly in the liver – its production being triggered by the release and presence of growth hormone. Obviously, growth hormone is anabolic as well (its name connotes anabolism), so raising IGF-1 via greater GH release would seem a distinct powerhouse combination for muscle building. Lifting weights increases both growth hormone and intra-muscular IGF-1. So simply being a bodybuilder, power-lifter, or other type of strength athlete likely gives you higher IGF-1 levels than those of sedentary folk. But lifting weights in combination with creatine supplementation raises IGF-1 even higher. That’s according to a study done at St Francis Xavier University, Canada back in 2008. Researchers took 24 male and 18 female subjects and divided them randomly into a test group and control group. The test subjects received .25g/kg lean body mass of creatine for 7 days, then .06 g/kg lean body mass of creatine for 49 days thereafter. The control group received an isocaloric placebo while all participants engaged an 8-week whole body resistance training regimen. Muscle biopsies done at the end of the study showed a 54% increase in IGF-1 among the placebo group and a 78% increase among those taking creatine. So lifting weights boosted IGF-1 and creatine appeared to amplify the increase by almost 25%. For the creatine marketing brigade, the above-mentioned study is sometimes presented alongside a simple experiment done at Chukyo University in Japan back in 2000. In this comparative cross-sectional study, 6 healthy males ingested a single 20-gram dosage of creatine without exercise. Over a six hour period following ingestion, researchers observed a huge spike in growth hormone among the test subjects, the biggest jumps occurring between the 2-hour and 6-hour marks. The placebo group showed a 45% increase in GH during the same period; the test subjects had a whopping 83% increase. The study’s researchers specified that the creatine’s at rest/high dose effect on growth hormone was similar to that stimulated by exercise (without creatine). The obvious question is whether these boosts in growth hormone and IGF-1 from creatine are significant enough to accelerate muscle hypertrophy beyond what’s attainable without them. Anecdotally, those of us who’ve used creatine are not strangers to downing 20 grams per day; that’s a typical loading dosage. If it was sending my GH skyrocketing when I did it – I can’t say I noticed. In order for a supplement to speed up muscle growth, it needs to improve protein synthesis either directly or indirectly. The enzyme responsible for regulating protein synthesis is mechanistic target of rapamycin (mTOR). Therefore, a supplement that positively affects mTOR is likely to improve protein synthesis and long-term strength and hypertrophy. If creatine does indeed significantly raise IGF-1, this could enhance mTOR. But there’s one study revealing that creatine might also positively affect important molecular substrates downstream of the mTOR pathway. One such substrate is 4E-BP1, a protein that binds to another protein substrate called eIF4G, the latter requiring unhindered activation for protein synthesis and muscle recuperation to occur. Thus 4E-BP1 needs to be deactivated through phosphorylation so that eIF4G can be activated. The double-blind study was a small one involving only six male subjects. They were divided into two groups of three, one group receiving 21 grams of creatine per day for 5 days while the other received a maltodextrin placebo. The subjects then engaged a one-time exercise protocol involving sets of leg presses at 70% of 1-rep maximum weight. After a one-month washout period, the treatments were crossed over. Muscle biopsy samples were taken and tested for IGF-1 mRNA expression and phosphorylation of anabolic signaling molecules downstream of mTOR. Three samples were taken; one at rest, another at 3 hours post-exercise, and a third at 24 hours post-exercise. The results showed an increase of IGF-1 (30%) and an increase of IGF-2 (40%) from creatine supplementation in resting muscle. However, while exercise caused a significant increase in both IGF-1 and IGF-2 at the 3-hour and 24-hour post-exercise marks, this increase was not potentiated by creatine. Thus, creatine and exercise appear to have no cumulative effect on IGF. And while the phosphorylation of downstream anabolic signaling hormones was not affected by creatine at rest, the phosphorylation of 4E-BP1 was significantly higher in the creatine group versus placebo at 24 hours post-exercise. Another experiment on creatine tested its effect on satellite cells and the number of myonuclei in human muscle. Satellite cells are dormant muscle precursor cells that are awaiting activation to regenerate damaged muscle cells. Myonuclei exist inside muscle fibers, their numbers largely determining how strong and big a muscle can grow. In this double blind 16-week study published in the Journal of Physiology, 32 young healthy male subjects were divided into four groups. One group received daily creatine (6-24 grams) with training. A second group received a protein supplement (20 grams) with training. Group three (placebo) received what appeared to be a supplement (no creatine/no protein) with training. Group four was a control group that neither trained nor received supplementation. The three training groups partook in an intense resistance regimen three days per week. And although all training groups showed an increase in satellite cells, the group receiving creatine showed a greater increase by week four compared to the placebo group and a greater increase by week eight compared to the placebo and protein groups. In addition, the creatine group demonstrated a 14-17% increase in the number of myonuclei per fiber at weeks four, eight, and sixteen. The following sentence quote sums up what the researchers think they discovered with this study. Does Creatine Build Muscle via Satellite Cells? In the discussion section of their paper, the ‘creatine/satellite cell study’ researchers offer the same question mark about creatine that’s often stopped me from being a raving fan of the stuff. The following is a quote. In other words, where’s the net gain from a supplement that only increases workout performance? They go on to point out that although creatine supplementation appeared to increase satellite cells and myonuclei at weeks 4 and 8 of their study and then return them to baseline, the myonucleus number and myofiber area of the muscles remained elevated thereafter. Bottom line: They suggest that THIS… is how creatine builds muscle. Here’s some food-for-thought based on the findings presented here combined with those of a few other ‘anabolic’ supplements. What if creatine were used with a sort of strategic synergism by “stacking” it with practices and ergogenics that enhance mTOR? Load on creatine during extra rest day created by infrequent workouts. Again, this is just an idea and not a recommendation. As of this writing, I’ve not tried this entire stack. However, since creatine could enhance eIF4G downstream of mTOR and also boost GH and IGF-1, it might make sense to combine it with other practices and ergogenics that have been shown to influence these areas. I’ll post further content as I discover more from both research and personal experimentation within the context of creatine and muscle building.